It has been a strange winter in Minnesota. We have had a few coatings of snow here and there, but nothing has stuck around for an extended amount of time. Even more unusual is the record-setting high temperatures we have had lately. On the way home from work today, on the 10th of January, my car thermometer registered an outside temperature of 52F! Normally, at this time of year we are putting a lot of effort into keeping our chickens warm. With our average January temperatures usually in the teens, it can be a real challenge. Not this year – not so far. This year the chickens are having a really great winter. They typically will not set foot outside the coop once there is snow on the ground. In the bright sunshine and fifty degree temperatures today however, they enjoyed several hours of free-ranging around the farm. They cover a lot of ground scratching, pecking, eating, or whatever they are doing, as they wander around the yard, into the woods, and through the gardens. 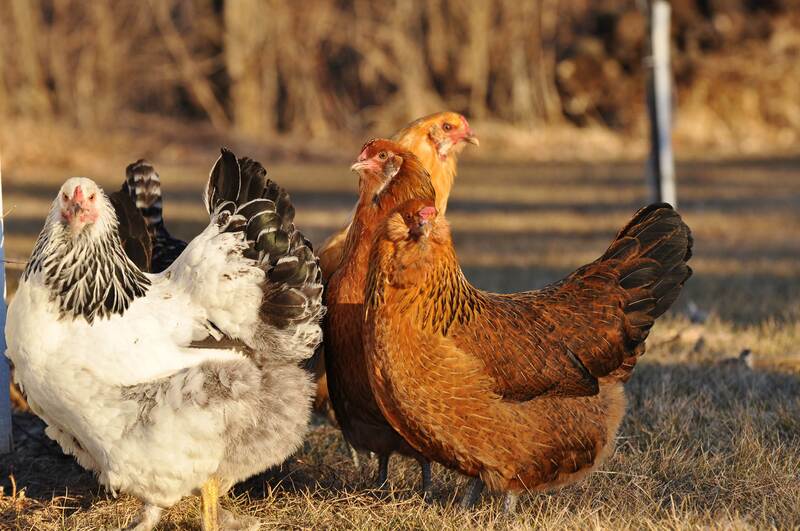 After the new hens from this spring started laying egg in the fall, we culled the old laying hens. Down to just ten hens, we gave two away to Jesse’s brother, and then lost one to some sort of predator. So, we now have only seven laying hens. They are really dazzling and healthy looking birds. All of them are prolific layers. With our oldest away at school (he ate a lot of eggs), we can’t keep up with eating all of their eggs and we so we try to give some away when we can. 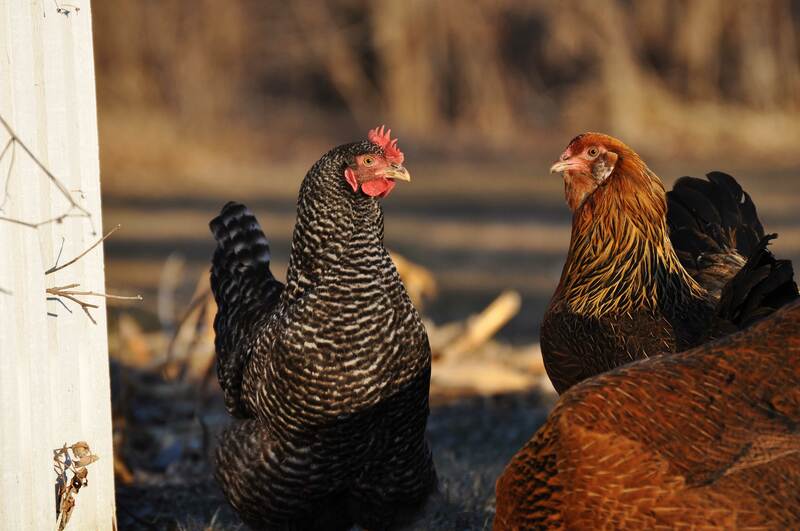 The black speckled hen on the left below is a Barred Rock and she lays brown eggs. 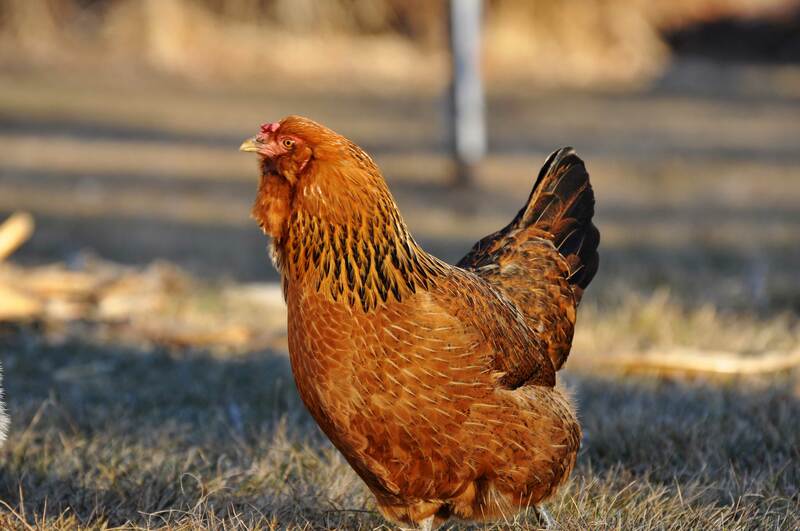 This gal is one of our three Araucana hens. I always try to make sure we have at least one Araucana because I love the spectacular light blue and green eggs that they lay. The white hen is a Light Brahma. The feathered feet on this breed are so cute. 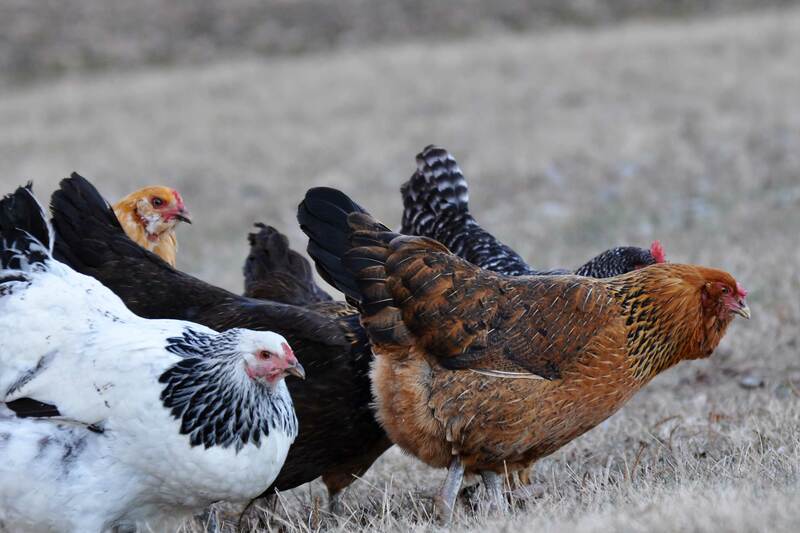 And even better, they are very reliable brown egg layers throughout the winter. 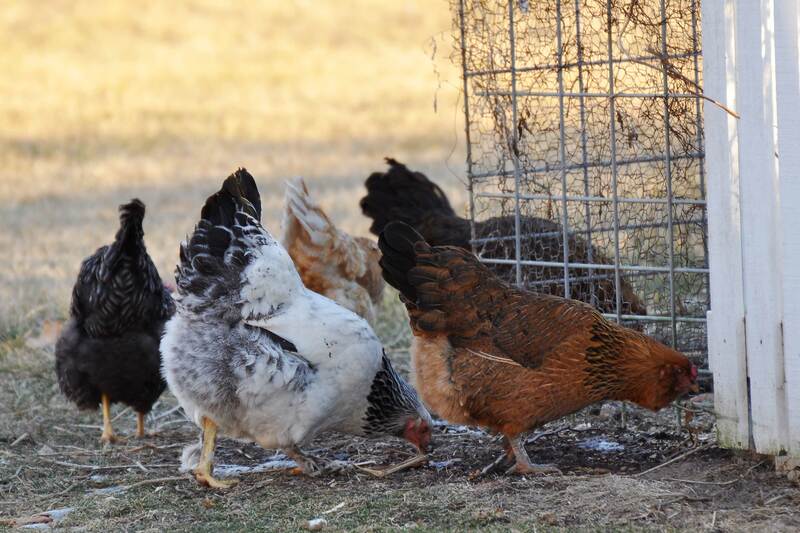 We ordered this assortment of laying hens last spring from Murray McMurray Hatchery, like we always do. We have never been disappointed by the chicks we receive from them. 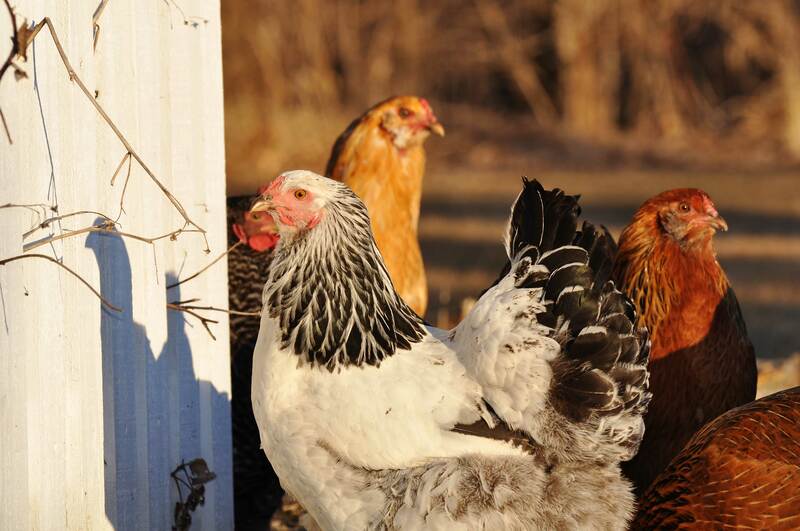 Our plan is to order more chicks for this spring – a few more laying hens and some meat birds. It sounds as though our warm weather might end in the next few days. Snow is predicted to fall as early as tomorrow and the chickens will inevitably choose to stay in the confines of their coop until the ground is bare once again. Based on our winter so far, I am hoping they won’t have to wait until spring.